Why do koalas need help in Central Queensland? How can I help? What is being done? Where will my money go? What about other tree living mammals? The Central Queensland Koala Volunteer Group has been established to support efforts to conserve koalas and other tree living mammals in Central Queensland. Support the rehabilitation and release of sick, injured or displaced koalas and tree living mammals. The Central Queensland Koala Volunteers are not about stopping development. The Koala Volunteers seek to encourage planned development, which allows for the co-existence of koalas and other tree living mammals with human activity. Why do koalas need help in Central Queensland? Across Central Queensland koalas are disappearing as a result of habitat destruction and alteration as the region's woodlands and forests are developed for agriculture, grazing, urban expansion and mining. Although koalas are still widespread across Central Queensland the populations are at an increased risk of extinction from drought, fire or disease which may affect them directly or the trees on which they depend. Scientists don't have enough information to determine the conservation status of the koala in this region. In some areas, such as the Duaringa Shire, koala numbers appear to have increased over the last few decades while in the Biloela area koala numbers appear to have declined over the last few years. In the Capricorn Coast area, east of Rockhampton, the species is all but extinct. More research is needed to find out just what is happening to koala populations in this region. The Koala Research Centre of Central Queensland has been set up within the Central Queensland University to attempt to answer some of the questions about koalas. Koala research is, however, labour intensive and almost totally community funded. 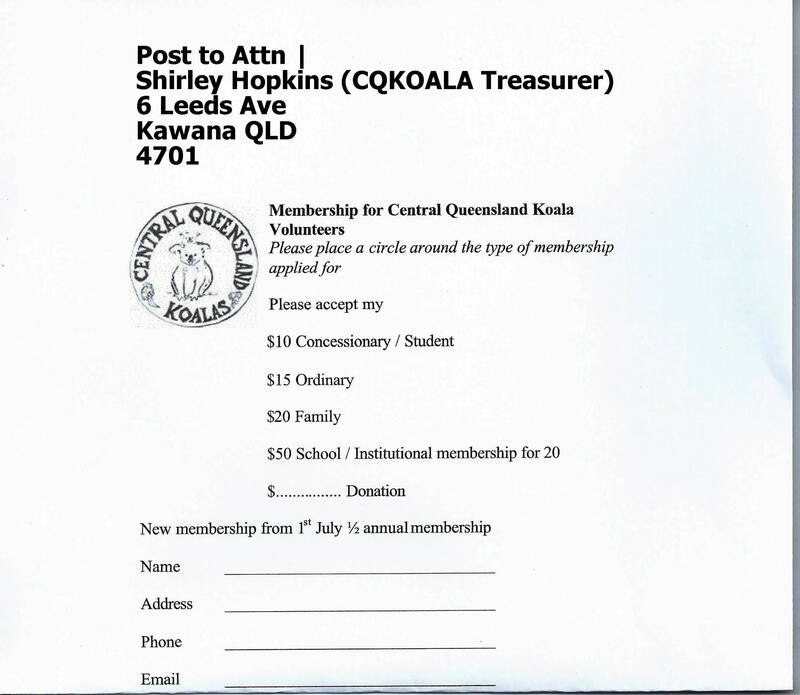 The Central Queensland Koala Volunteers was established, as a non-profit organisation, to provide volunteer labour and fundraising support for the koala research. Very little is known about the overall conservation status of any of the possums or arboreal rats and tree rousting bats. Because these animals use relatively small areas of habitat, national parks are probably large enough to protect these populations (although no one has really looked). The dependence of many of these animals on hollow trees as roosts may make them more vulnerable than koalas as inappropriate burning can eliminate potential hollows from an area even though the forest is protected. Outside of national parks the situation is the same as with koalas. Where trees are removed so are the tree living mammals. In many parts of Queensland koalas and other tree living mammals live successfully alongside urban, rural and mining activities. In almost all cases this coexistence has come about by accident. With the right information, obtained through careful observation and research, viable habitat can be retained alongside active development or it can be regenerated on lands already fully developed. Research needs lots of hands and eyes. Join the Central Queensland Koala Volunteers and you could help the researchers with their projects. You can help by volunteering for research projects. The scientists at the Koala Research Centre will need assistance with (1) field koala surveys at various areas in Central Queensland (2) feeding experiments with captive koalas (3) recording koala sightings from Central Queensland. Funds are needed to maintain the research effort, support the volunteer projects and assist with the care and rehabilitation of sick and injured animals. You can help by raising funds for research, donating money, time and ideas. In addition you can help to retain, restore and manage habitat. in your own area. Memberships and funds raised by the Koala Volunteers are used to buy equipment for the researchers, to fund volunteer teams in the field and provide limited support for animal carers. Donations may also be made to the Koala Research Centre of Central Queensland and are tax deductible. Once your membership has been accepted you will receive a regular newsletter and information about upcoming events and meetings.